Nakur, magician of the sandesh, rides the globalisation wave. The latest addition to its variety is the sandesh filled with vodka, whisky, rum or brandy. Best of all, the price is in the same bracket as its usual range. Nakur plans to retail the liquor sandesh via its stores within the RPG Group’s Spencer’s Retail chain. Somnath Dasgupta reports. Such interruptions are not a bother for the 52-year-old Nandy, who runs the show with his two brothers and two nephews. He supervises every step and churns out new products over addas (Bengali for hanging out) with friends. 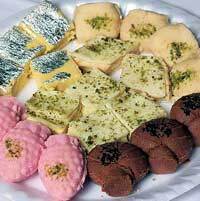 The latest is a sandesh unlike any of the other 20-25 varieties that fly off the shelves in ones and twos or hundreds at a time. This one will be filled with vodka, whisky, rum or brandy. Best of all, the price will be in the same bracket as Nakur’s usual range. Then, it has plans to retail the liquor sandesh via its stores within the RPG Group’s Spencer’s Retail chain. So, what makes this sweetened piece of milk curds so special? For one, Nakur’s is the undisputed king of the sandesh, having begun making the sweetmeat way back in 1844. Nakur’s does not make any other— no rosogollas, nothing dipped in syrups, no snacks like samosas. For the melt-in-your-mouth sandesh Nakur’s makes, fresh buffalo milk comes from trusted suppliers. After being boiled in batches of 40 litres, chhena water is added, leaving around 11 kg of snow-white chhena. This is strained over muslin, without any pressure. The chhena is then processed by Nakur’s secret weapon: the bare hands of a man who spends his days massaging huge piles of chhena in batches. The result: Grainy chhena ready for the next stage, in which it is cooked with sugar and other additives to give the basic dough that goes into the sandesh. “The key is the grain,” Nandy says. The sandesh comes in two basic classes—the kora (hard), and the norom (soft). Then, there are variants depending on the sweetener used or the shape given. Nakur’s, which had earlier pioneered varieties that taste of oranges, pineapples, mangoes, kiwi, lichi, and strawberry, using pure fruit pulp, had even tried out a salted sandesh, aptly named chini-na (no sugar), in which, instead of sugar, the additives were olive oil, rock salt and fried cashew nuts. It was too radical, though, for its time. The liquor sandesh has hit a hurdle, for now. Spencer’s wants Nakur’s to procure a liquor licence. And Nandy, although aware that no store selling rum-chocolates has one, is being doubly cautious and has decided to proceed methodically. If a licence is needed, so be it. Rs 15 The average price per liquor sandesh. 25Number of sandesh varieties sold. Rs 30,000crore The estimated turnover of India’s sweets business. 80%West Bengal’s share of India’s total sweet business. 1844The year Girish Chandra Dey-Nakur Chandra Nandy was set up. 2001 was the year when the pineapple sandesh was launched. The sandesh has no dearth of eager takers. A customer wants 1,000 pieces each of two types for a wedding in Nagpur. No wonder, India’s sweetmeats business is reported to have a turnover of Rs 30,000 crore a year, according to unofficial figures, with 80 per cent being accounted for by West Bengal. Nakur’s first big break out of its north Kolkata lane came when it got a foothold at an outlet in the Mahalaxmi temple built in Kolkata in 2004 by Rama Prasad Goenka of RPG Enterprises. Nakur’s was introduced to RPG by Mani Shankar Mukherjee, Chief Advisor (Corporate relations) at RPG, who is also a renowned Bengali novelist writing under the pseudonym Shankar and is an authority on life in Kolkata down the ages. The magic of Nakur’s sandesh worked yet again and when RPG’s Spencer’s opened big stores in the Gariahat market and the Mani Square Mall earlier this year, Nakur’s was invited to set up shop. Emboldened by the success of his first “branches” at Spencer’s, Nandy is looking out for partners in Mumbai and Delhi, confident of strong sales as he claims to have won over the palates of secondand third-generation Marwaris and north Indians. “We can’t afford real estate in Mumbai, but let me tell you: we have many fans in those cities,” says Nandy. The Bachchan household is reported to be one. But Nandy is determined to stick to his core competency of making and selling the sandesh—no eatingin, no diversification. “I am not running a hotel,” he says stubbornly. There will also be no machinery or assembly line. “After all, the best quality Swiss chocolates are all handmade,” says Nandy. He should know, considering Nakur’s is the last word for sandesh connoisseurs. But one big change is on the way: the small board proclaiming “we have no branch” has to be removed, taking with it a piece of history.